On Friday, 3 March 1995, President Howard W. Hunter passed away, leaving mortality at 8:35 A.M. at his apartment. President Hunter’s death, from natural causes associated with prostate cancer, drew to a close his nine-month, five-day leadership of the Church that began 30 May 1994, the day President Ezra Taft Benson died. 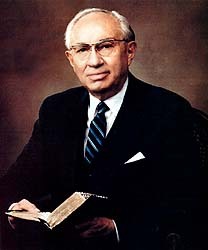 Thus passed the mantle of priesthood leadership of the kingdom of God on earth to President Gordon B. Hinckley. At the death of the President of the Church, the First Presidency is dissolved and priesthood leadership in the Church at that moment reverts to the Quorum of the Twelve Apostles. Order within the Quorum of the Twelve is by rank of seniority from the time members are called to the Quorum, the members of which are sustained as prophets, seers, and revelators to the Church. 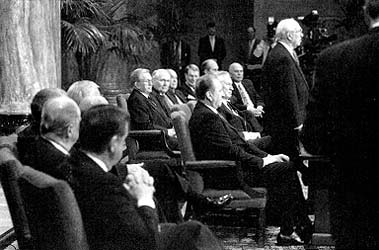 At the death of the President of the Church, counselors in the former First Presidency who are Apostles and numbered within the Quorum of the Twelve return to their order within the Twelve. Consequently, on Sunday, March 12, President Gordon B. Hinckley, as President of the Twelve, called a meeting of Quorum members, each of whom individually holds in trust all of the keys of the priesthood of God on earth. They met to reorganize the First Presidency. They then ordained and set apart President Gordon B. Hinckley as President of The Church of Jesus Christ of Latter-day Saints, President Thomas S. Monson acting as voice. President Gordon B. Hinckley then set apart Thomas S. Monson as First Counselor in the First Presidency, and as President of the Quorum of the Twelve, and he set apart James E. Faust as Second Counselor in the First Presidency. 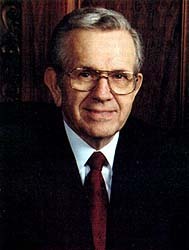 Boyd K. Packer was set apart by President Hinckley as Acting President of the Quorum of the Twelve. On Tuesday, March 7, President Hunter’s body lay in state in the large reception room in the Church Administration Building, where 25,212 people in attitude of mourning and respect filed by the bier. On Wednesday, March 8, preceding President Hunter’s funeral and prior to the closing of the casket, Richard A. Hunter, a son of President Hunter, offered a family prayer. As the noon hour approached, a cortege followed the hearse carrying President Hunter’s coffin to the Tabernacle for funeral services that were widely televised in Utah and carried over the Church’s satellite network to locations throughout the United States, Canada, the Caribbean, and Mexico. President Gordon B. Hinckley presided at and conducted the funeral. The Tabernacle Choir sang “I Need Thee Every Hour,” followed by an opening prayer given by Elder M. Russell Ballard of the Quorum of the Twelve. The first speaker was Jon M. Huntsman, President Hunter’s former stake president and a family friend. He was followed by the choir singing “How Great Thou Art.” The next speakers were Elder James E. Faust of the Quorum of the Twelve and President Boyd K. Packer, who were followed by the choir singing “Nearer, My God, to Thee.” President Hunter’s counselors, President Monson and President Hinckley, then spoke, followed by the choir singing “Abide with Me; ’Tis Eventide.” The closing prayer was by Elder Jeffrey R. Holland of the Quorum of the Twelve. The cortege then journeyed a little over a mile eastward to the Salt Lake City Cemetery, where John J. Hunter, a son of President Hunter, gave the dedicatory prayer at graveside, concluding a day of solemnity and great appreciation for the life and ministry of President Hunter. President Hinckley now comes to the office of President of the Church at age eighty-four. Behind him are nearly thirty-seven years of service as a General Authority of the Church since he was sustained an Assistant to the Twelve on 6 April 1958 at age forty-seven, over thirty-three years since he was sustained to the Quorum of the Twelve Apostles on 5 October 1961 at age fifty-one, and nearly fourteen years of service in the First Presidency. In 1981, at age seventy-one, he was called as an additional counselor in the First Presidency to serve President Spencer W. Kimball. In December 1982 he became Second Counselor to President Kimball, followed by a call in 1985 to serve as First Counselor to President Ezra Taft Benson. In 1994 he was called to serve as First Counselor to President Hunter. President Hinckley has thus served as a counselor to three Presidents of the Church. He was born 23 June 1910 in Salt Lake City. President Hinckley and his wife, Marjorie, are the parents of five children. 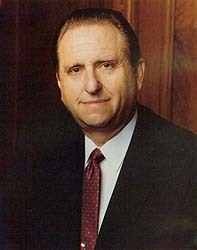 President Monson, First Counselor to President Hinckley, has served as a General Authority for over thirty-one years since being sustained on 4 October 1963 at age thirty-six to the Quorum of the Twelve; he nears completion of nearly a decade of service in the First Presidency. In 1985, at age fifty-eight, he was called as Second Counselor to President Benson, and in 1994 he was called as Second Counselor to President Hunter. With this call again to the First Presidency, President Monson begins his service as a counselor to a third President of the Church. He was born 21 August 1927 in Salt Lake City. President Monson and his wife, Frances, are the parents of three children. He is sixty-seven years of age. President Faust, Second Counselor to President Hinckley, has served as a General Authority for nearly twenty-three years since being sustained an Assistant to the Twelve on 6 October 1972 at age fifty-two. On 1 October 1976, at age fifty-six, he was sustained to the Presidency of the First Quorum of the Seventy, and on 30 September 1978, at age fifty-eight, he was sustained a member of the Quorum of the Twelve Apostles, in which capacity he has served for nearly seventeen years. President Faust was born 31 July 1920 in Delta, Utah. He and his wife, Ruth, are the parents of five children. He is seventy-four years of age. 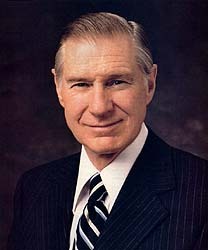 President Packer, Acting President of the Quorum of the Twelve, has served as a General Authority for nearly thirty-four years since being sustained an Assistant to the Twelve on 30 September 1961 at age thirty-seven. He has served in the Quorum of the Twelve nearly twenty-five years since being sustained to the Quorum on 5 April 1970 at age forty-five. He was called to serve as Acting President of the Quorum of the Twelve in 1994 because the President of the Twelve, President Hinckley, was serving as First Counselor in the First Presidency to President Hunter. President Packer was born 10 September 1924 in Brigham City, Utah. He and his wife, Donna, are the parents of ten children. He is seventy years of age. 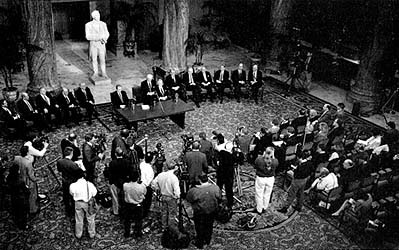 On Monday, March 13, at 9:00 A.M., the day following the reorganization of the First Presidency, the new First Presidency, joined by members of the Quorum of the Twelve, held a media conference in the lobby of the Joseph Smith Memorial Building to announce the previous day’s action. “One cannot come to this sacred office without almost overwhelming feelings of inadequacy. Strengthened resolution to go forward comes from the knowledge that this is the work of God, that he is watching over it, that he will direct us in our efforts if we will be true and faithful, and that our accountability is to him. “As the Church moves forward on its divinely appointed mission, I do not anticipate any dramatic change in course. Procedures and programs may be altered from time to time, but the doctrine is constant. We are dedicated, as have been those before us, to teaching the gospel of peace, to the promotion of civility and mutual respect among people everywhere, to bearing witness to the living reality of the Lord Jesus Christ, and to the practice of his teachings in our daily lives. “We are concerned with the quality of family life within so many homes. The home is the seedbed of all true virtue. If proper values are not learned in the home, they are not likely to be learned anywhere. “We are grateful for the faith and the strength of the people of this church. They now number some nine million in approximately 150 nations and political entities. The membership is growing consistently and solidly. We are confident that this will continue as the Church stands as an anchor of truth in a world of shifting values and standards. “We are particularly proud of our youth. I think we have never had a stronger generation of young men and women than we have today. For the most part they are true to the faith of their forebears. Surrounded by forces that would pull them down and tremendous pressures to pull them away from time-tested virtues, they are going forward with constructive lives, nurturing themselves both intellectually and spiritually. We have no fears or doubts concerning the future of this work. “If we have offended any, we apologize. Our only desire is to cultivate a spirit of mercy and kindness, of understanding and healing. We seek to follow the practice of our Lord, who ‘went about doing good’” (Acts 10:38). At the April 1–2 general conference, a solemn assembly will be held through which all members of the Church, those in general assembly at the Tabernacle and those watching or hearing the proceedings on live broadcast or seeing the conference later on videotapes, have the opportunity to personally sustain the new First Presidency and other General Authorities. The prayers and thoughts of members everywhere now go with President Hinckley and his counselors as they guide the affairs of the Church through the inspiration of the Lord Jesus Christ, whose church this is and whose sacred name it bears.